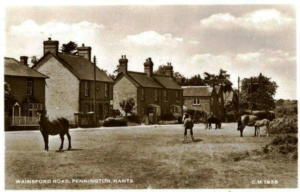 According to the Vision of Britain website, the name Pennington was first recorded in 1272, its hypothetical derivation being from the Old or Middle English ‘Peni(n)gtun’ = ‘penny farm’, ie a farm on which a penny geld was payable. Until 1839, Pennington was ecclesiastically part of the parish of Milford. The boundary between Lymington and Milford followed the course of the Stanford rivulet which flows under the A 337 west of Lymington. When Pennington was part of Milford, its parish church was All Saints’, Milford. From Pennington village, the distance to Milford church was about three and a half miles. Roads were poor, only the wealthy could afford a horse or carriage, and for most people getting to church entailed a long walk across country. In such remote places, a chapel of ease was sometimes built for the convenience of parishioners; it is believed that there may have been a chapel of ease for Pennington, dedicated to St Mary Magdalene, which remained in use until the time of Elizabeth I. The Christchurch Priory Cartulary records an agreement in the early 13th century between the Priory and the vicar of Milford on the one part and Henry de Ponte Audomar on the other part, granting Henry a chapel in his house at Pennington. A special service was to be held on the feast of St Mary Magdalene, when the service was to be conducted by the vicar of Milford. The Victoria County History states that there was a chantry chapel dedicated to St Mary Magdalene, the earliest known record of which dates from 1285. The fact that the putative chapel of ease, the chapel in Henry de Ponte Audemar’s house, and the chantry chapel shared a special devotion to St Mary Magdalene may indicate that they were all the same place. The location of none is known today. An endowment for the chantry chapel was derived from sixty acres of land known as the Priestlands, which extended from the centre of what is now Pennington village to the west end of Lymington town. It is still possible to walk through some of the woodlands and see the remains of the stewponds which once formed part of the Priestlands estate. A century later, Priestlands belonged to Captain F. Ellis, JP, and in the 1920s to Major Tillyer Blunt. Between 1955 and 1957, the estate was made the site of the new County Secondary School. 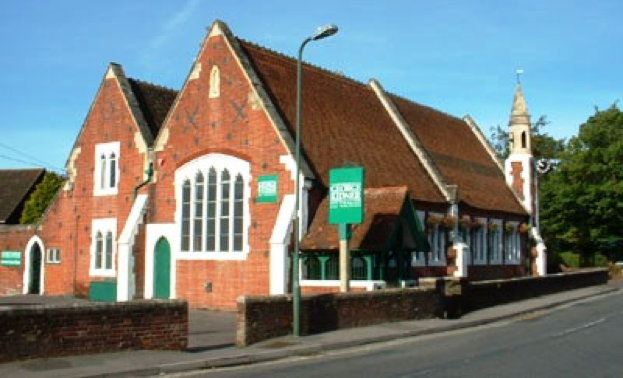 Priestlands House was retained as the Gurney-Dixon Residential Centre by Hampshire County Council’s adult education service. It was closed as an economy measure in 1993 and the County Council put it up for sale. A local outcry forced the Council to reconsider, and the building was subsequently renovated and incorporated into Priestlands School. More recently, an infants’ school and a junior school, a swimming-pool and a leisure centre have all been built on the estate. The lakes, which had degenerated into a bog, were restored by the Environment Agency in 2000. 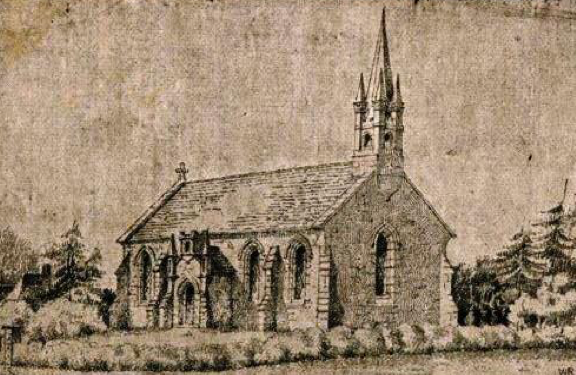 In 1839, Pennington gained a church of its own. John Pulteney, Lord of the Manor of Pennington, donated a piece of land on the common; a building was designed by John Tulloch, a Wimborne architect; and the foundation stone was laid by John Pulteney on 25 April 1838. Local poet Caroline Bowles wrote a poem to mark the occasion. St Mark’s church and churchyard were consecrated by the Bishop of Winchester on 13 March 1839. However, the benefice of Pennington was still in the gift of the vicar of Milford. In 1848, Rev William Lambert came to Pennington as vicar. He soon found that the great majority of the population were illiterate and many did not even know their age. 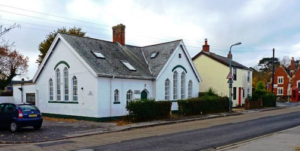 The only educational facilities in the village were the primitive schooling provided in four private cottages. Lambert immediately set about seeing that a proper school was built in Pennington, and the village school opened in 1852 as Pennington Parochial School. A house providing accommodation for the schoolmaster adjoined the school building. The land had been part of Pennington Common. Sports and games were played on fields belonging to the Priestlands estate. Within a generation, the school proved to be too small, and the whitewashed IRC building opposite North Street was built in 1886 to provide additional classrooms. They continued to be used as infant-school classrooms down to within living memory. The church at Pennington measured only 47 feet 6 inches by 20 feet 6 inches. According to the 1851 ecclesiastical census, the seating capacity was 280. Morning attendance on Census Day (30 March 1851) was 266, afternoon attendance was 250, and there was no evening service. It was clear that the church was being used to capacity, and over the next few years, the situation must have worsened. On 25 May 1858, the Bishop of Winchester granted the petition of Rev William Lambert and John Miles, churchwarden, that the existing church should be pulled down and replaced by a larger building. 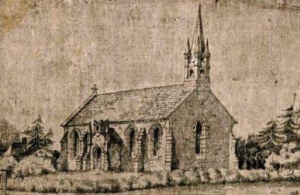 In 1859, Pennington was constituted a separate ecclesiastical parish, and the 1839 building was replaced by the present church. While the new church was being built, services were held in the village school. The new church was consecrated by the Bishop of Winchester on St James’s Day, 25 July 1859. The architect was Charles Edward Giles. It is a good example of ‘Gothic Revival’, an architectural style associated with William Butterfield. In contrast to Lymington, which was a planned Norman new town with a wide High Street and regulated burgage plots, Pennington is a nucleated village, one in which the principal buildings – the church, the mill, the inn, the forge – clustered around a central focus. This pattern can still be seen today, with the village shops and post office, pubs, school and parish church all within yards of each other. Such villages often had a Back Lane running parallel to the main street to provide a rectangular framework for the development of the village. In Pennington, the Back Lane is now North Street – the name was changed in 1898. It was less common for the main street to be called Front Lane, as it was in Pennington: this is now South Street. In the nineteenth century, Pennington was poor. The poverty of pupils in the 1870s is apparent from the fact that many children were unable to pay school pence, boys were leaving school to start work at the age of ten, and in 1878 three children were sent to the workhouse. In 1882, by which time schooling cost 1½d per child per week, it was decided that no parents should have to pay more than 6d a week – so families with more than four children at the school could send the youngest ones for free. In 1885, there was an outbreak of smallpox in the village and children were vaccinated at the school; two years later, there was an outbreak of scarlet fever. In 1889, the cost of schooling was increased to 2d per child. In 1911, Pennington became a separate civil parish and so totally independent of Milford. In 1932, Pennington, together with Milford-on-Sea, Hordle and New Milton, became part of the new enlarged borough of Lymington. This continued until 1974 when local government reorganisation led to the creation of the New Forest District Council. 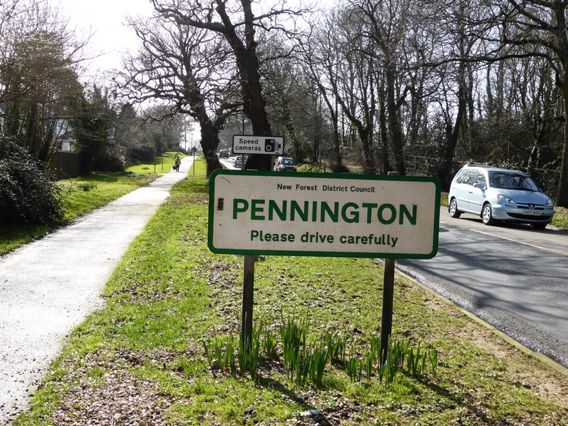 At a more local level, Lymington and Pennington merged to form the Lymington and Pennington Town Council. Pennington Common lies in Upper Pennington. From early times there was a water mill on the common; the last record of the mill that was found by the VCH compilers dated from 1819. There was a large pond on the Ramley Road side of the common, and in winter people came from miles around to skate there. In the exceptionally wet winter of 2013/14, the pond reappeared! Residents had the right to dry their washing on the common – either to erect a line or to spread their garments and linen out on the furze bushes. There were also the usual rights of pasture, and at one time, so many donkeys grazed on the common that Pennington was known locally as ‘Donkey Town’. Cows and ponies also grazed there at will until the Forest was fenced. 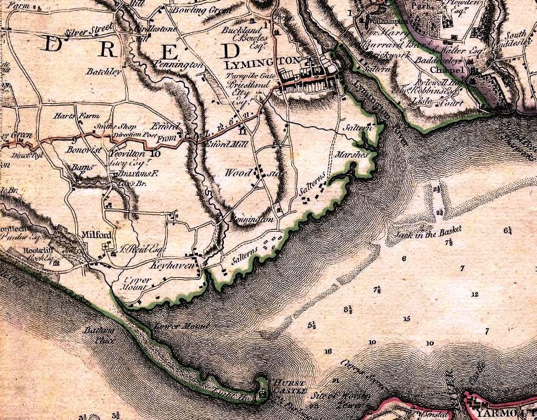 In the eighteenth and early-nineteenth centuries, the inhabitants of Pennington and Lymington (like those of other places along the south coast) were heavily involved in smuggling, while poaching was rife everywhere. On Sundays, people would come to the Upper Common to drink and to dance, and smuggled liquor could be purchased from certain residents. One local coal-hawker was known to sell coal by day and put his cart at the disposal of smugglers and poachers by night. During the Napoleonic Wars, there were military encampments on Pennington Common. In 1814, a duel was fought on the common between Captain Henry William Souper, Paymaster of the Foreign Military Depot at Lymington, and Lieutenant John Dieterich, Adjutant of the Foreign Military Depot at Lymington. Dieterich was mortally wounded. Souper was arrested, charged with Dieterich’s murder, tried at Winchester Assizes, found guilty and sentenced to be hanged. 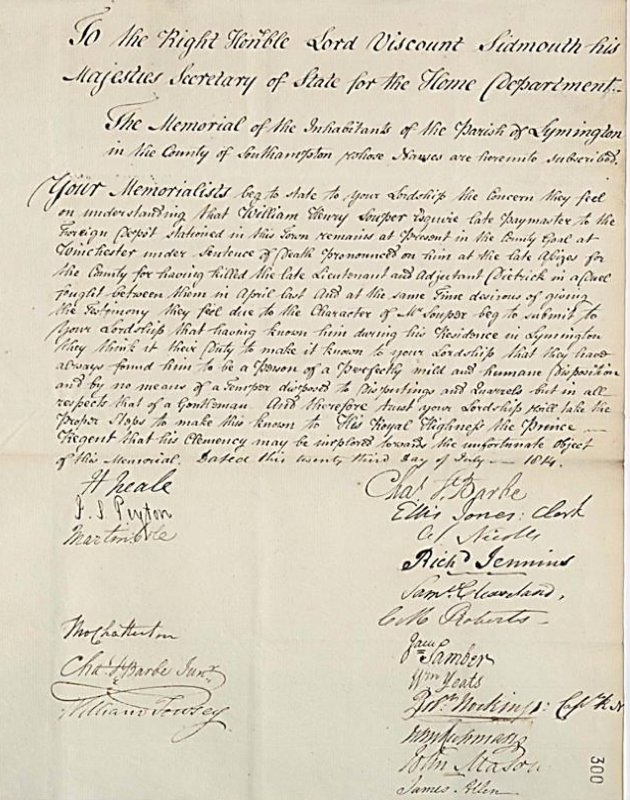 Subsequently, five petitions calling for clemency were submitted to the Government, two of them signed by many of Lymington’s most prominent citizens. The appeal judge recommended mercy and Souper received a free pardon, but his military career suffered. It has been said that this was the Army’s last duel, but this was not so. 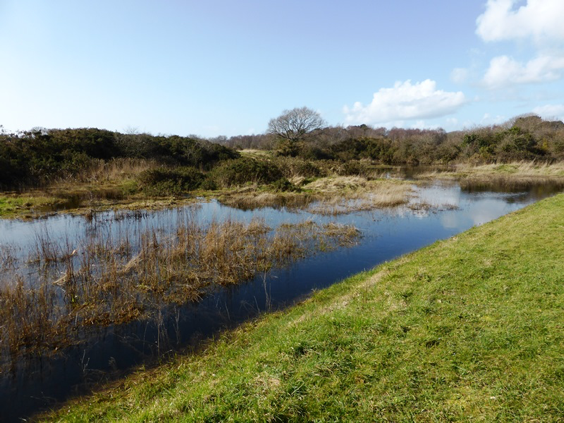 Since the establishment of the New Forest National Park Authority in March 2005, all of Pennington Common falls under the planning and land control of the Authority. It is now a valuable recreational facility, used by families, joggers, dog-walkers etc. There are also regular annual visits by fairs and circuses. Geld was the tax paid to the Crown by English landholders before the Conquest, and continued under the Norman kings (OED). This is the spelling recorded in the Christchurch Priory Cartulary. Sir Samuel Gurney-Dixon (1878-1970) was Chairman of the Hampshire Education Committee 1929-1947, and Senior Pro-Chancellor, University of Southampton 1952-1966. He served on a number of major educational bodies. Hampshire Advertiser, 30 March 1839. 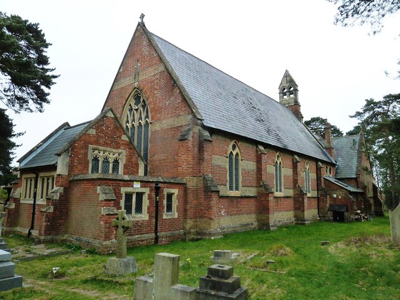 HRO: 19M90/PW1 – faculty for pulling down and rebuilding the church of St Mark’s, Pennington. Hampshire Advertiser, 30 July 1859. From the school logbook in HRO. Recovery Roll, Michaelmas 60 Geo. III, rot. 334. 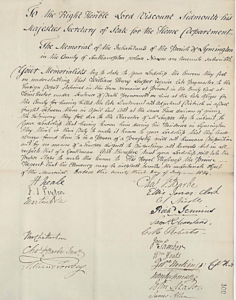 In the eighteenth and early nineteenth centuries Lymington had a military depot that accommodated a number of foreign troops – mostly artillery but including several militia regiments. At the time of the Napoleonic Wars, the King’s German Legion was based here, as well as Dutch, French émigré and other German units. Officer having charge of the administrative and organizational requirements of a battalion, regiment, or other unit (OED).